The DC scenario has become almost dream-like, with events fluttering out of sense in place and time, like from a crazed-Aaron-Sorkin-tinted episode of ‘The Twilight Zone,’ depicting a West Wing zombie apocalypse. President Donald Trump questioned why the Civil War — which erupted 150 years ago over slavery — needed to happen. The president floated, and backed away from, a tax on gasoline. Trump said he was “looking at” breaking up the big banks, sending the stock market sliding. He seemed to praise Philippines strongman President Rodrigo Duterte for his high approval ratings. He promised changes to the Republican health care bill, though he has seemed unsure what was in the legislation, even as his advisers whipped votes for it. And Monday still had nine hours to go. “It seems to be among the most bizarre recent 24 hours in American presidential history,” said Douglas Brinkley, a presidential historian. The comments took politicians of both parties — and some of his aides — by surprise. They came after Trump had earlier surprised foreign policy experts with a “very friendly” conversation with Duterte on Saturday night, and an invitation to visit the White House. Duterte has not accepted and said he might be too busy to come. Authoritarians are often ungenerous people, but they do give us one gift: they tell us what they are going to do before they do it, both as an intimidation and as a challenge. Trump always follows this rule. At his weekend rally, he recited the lyrics of a song by Al Wilson about a woman who rescues an ailing snake, only to find that as soon as the snake feels better he bites her. 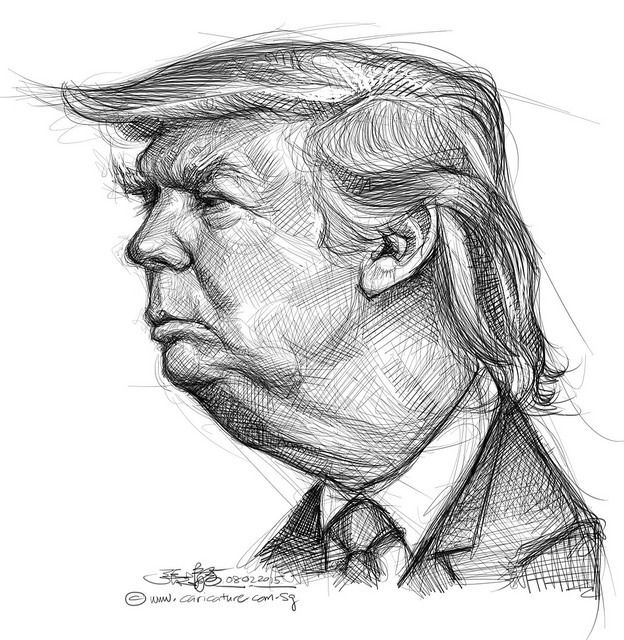 (Illustration above: Donald Trump, ‘Basic Shapes,‘ by caricaturist/illustrator Chong Jit Leong, found here).